Tomatoes stuffed with rice and sweet paprika. Recipes from Russia. 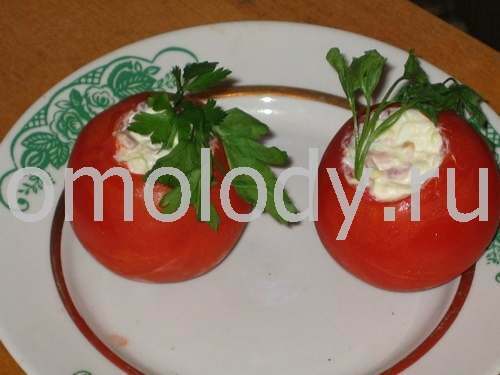 Tomatoes stuffed with rice and sweet paprika. 500 g (1,1 lb) fresh ripe tomatoes, washed an deseeded. 1 hard boiled egg, cubed. 1 cup rice, boiled, drained. 2 sweet paprika, washed and deseeded, cubed. 3 tbsp oil, to simmer paprika. ground pepper, salt to taste. 2. Simmer paprika with the oil in the pan. Cool. Mix paprika with rice, egg and mayonnaise. Season with salt, parsley, pepper. Stir. 3. Fill tomatoes with the mixture. Sprinkle the stuffed tomato with chopped dill.